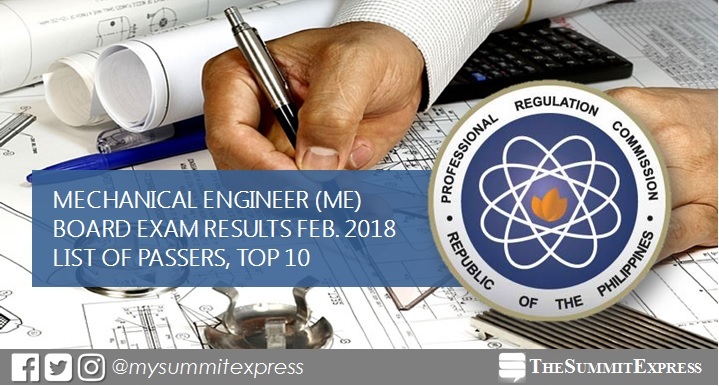 MANILA, Philippines - (Updated March 2) The February 2018 Mechanical Engineer (ME) and Certified Plant Mechanics (CPM) board exam results to include the list of passers, topnotchers (top 10), top performing schools and performance of schools are released online on Friday, March 2, 2018 or in three (3) working days after the exam. The Professional Regulation Commission (PRC) and the Board of Mechanical Engineering conducted the licensure exam in the cities of Manila, Baguio and Cebu on February 26 and 27. March 7 to March 16, 2018, registration for the issuance of Professional Identification Card (ID) and Certificate of Registration will be done online. In the same period last year, results were also released in 3 working days. A total of 1,083 out of 1,904 (56.88%) passed the mechanical engineering licensure exams while 19 out of 39 hurdled the CPM exams. In the March 2016 exam, results were announced in 3 working days. PRC named 910 out of 1645 (55.32%) who passed the ME board and 33 out of 53 (62.26%) for the CPM exams. MANILA, Philippines - Samsung Electronics officially unveiled their next flagship devices, the Galaxy S9 and S9+ at the Mobile World Congress in Barcelona, Spain on Sunday, February 25 (Monday in Manila time). Local launch event was also held announcing the official price and release date in the country. The Galaxy S9 and S9+ boast its advanced camera, redesigned with a new Dual Aperture lens that powers an innovative low light camera, Super Slow-mo video capabilities and personalized AR Emoji. S9 promised an enhanced entertainment experience with powerful stereo speakers tuned by AKG, immersive audio with Dolby Atmos and a refined edge-to-edge Infinity Display – a key staple in Samsung’s design heritage. In addition, the Galaxy S9 and S9+ come with the new SmartThings app, which unites Samsung’s existing IoT services into one single, smart experience. The Samsung Galaxy S9 and S9+ will be available in the Philippines starting March 16 (Friday). It will be offered in Midnight Black, Titanium Gray, Coral Blue and a new hue, Lilac Purple. Pre-order will run from February 27 to March 6. 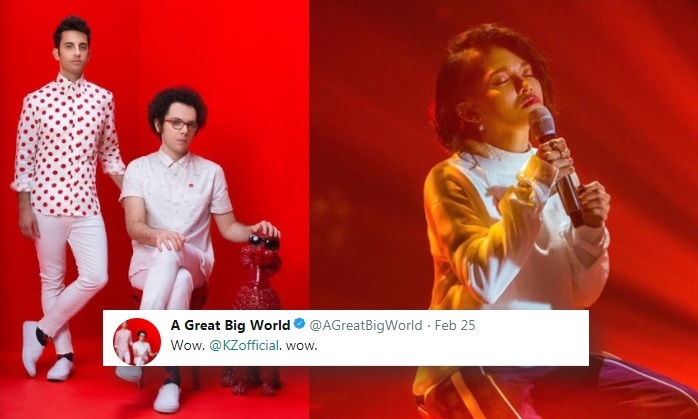 MANILA, Philippines - The singers of the hit song “Say Something” was blown away by KZ Tandingan’s rendition of the song. During the seventh episode of Singer 2018, KZ roused the audience with her acoustic version of “Say Something.” The singer-performer admitted that she felt nervous with the results because the audience’s response wasn’t as warm compared to her previous performance. In the end, she felt relieved that she’s back in the top 5 as she ranked number 4 for that week. KZ’s dramatic performance may have been impressive but she still couldn’t get away from a few bashers. A netizen on Twitter commented on KZ’s “Say Something” performance saying, “"@KZofficial pakinggan mo naman ung music as background sa Singer 2018, wala ka sa timing beh. Sayang." KZ decided to explain that it merely because of post-editing issues. She replied, “Inaayos nila ngayon. Kasi nagkaproblema sila sa post editing ng video kaya nagka ganun. Sorry beh ha nasayang tuloy. Tag kita pag naibalik na nila sa original. Thank you beh." "We had to fly Macoy (her guitarist) last minute for this and she only got to rehearse this song on the day of the recording but still delivered an awesome performance. We love you! 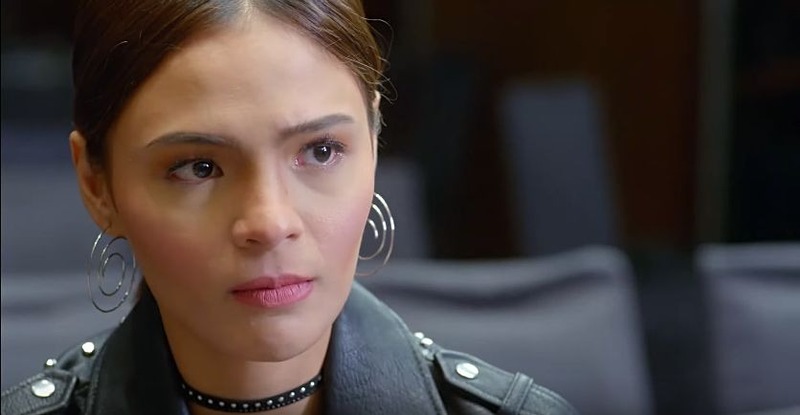 KZ Tandingan"
Directed by Joel Lamangan, “The Significant Other” tells the age-old tale of a cheating husband, in this case played by Tom Rodriguez (Edward), married to Lovi Poe’s Maxene - a top model who decided to temporarily walk away from her career to focus on her own family. Her eagerness to return back to the limelight prompted her husband to cheat with Erich Gonzales’ Nicole. Distributed by Star Cinema, it’s advertised as a steamy love story, but in reality, it doesn’t have a strong romantic through-line to be called as such. Storytelling-wise,”The Significant Other’s” film flow was incredibly jumpy made worse by the unnecessary time-warps to the point that quick cuts and sudden change in pace can be really off-putting. This didn’t help the film’s script considering how inconsistent the film’s tone is. If anything, it only made the movie feel tacky, almost like a parody. There’s no attention to the finer details whatsoever, and some characters are simply just there, without any purpose or meaning. Not a surprise considering how its main trio didn’t exactly have a clear arc, but still, it’s odd that we devote screen time for third-tier characters when it could’ve been used to delve more on Maxene’s, Edward’s and Nicole’s respective journeys. One positive factor in the movie is Poe’s performance. She sold her character’s struggle to want to return to her career after devoting years of her life to her growing family. In just a few scenes, she unfortunately, the way her narrative progressed didn’t give her the opportunity to standout from movie wives cheated by their husbands. It gets more insulting when Edward wasn’t held accountable for his actions. He was just given a two-second shot of supposedly regretting what he did, but with how forthcoming he was with his mischiefs, it’s difficult to buy the idea that he’s a changed man in a matter of weeks or months. Worse, both Maxene and Nicole appeared to have quickly moved on after the scandal that went down a very public fashion gathering. In the end, it felt like The Significant Other’s main purpose is for the intimate scenes, which is such a let-down from a director like Lamangan who’s done great pieces like “Sabel,” “Aishite Imasu 1941: Mahal Kita” and “Mila” in the past. Almost a decade after, it’s difficult to see that a lot of these cheating narratives are still trying to capitalize on the popularity that “The Other Woman” garnered. Outside of the the change-up in character profiles, not much is different. The patterns are almost similar, and what’s worse, most of the contemporaries don’t have the nuanced take on the story like the Ruel S. Bayani-flick. MANILA, Philippines - PAYO, a gateway that manages and simplifies Cash on Delivery (COD), launches its new platform in a bid to help simplify and improve the productivity of online businesses and enable them to fully take advantage of the e-commerce platform. L-R: PAYO was developed for HLM, an ecommerce platform and a leading call center business founded by Ofri Kadosh and his business partner, Liron Gross, co-founder and COO, to scale up their sales and reduce cancellations. The Philippines was the first country PAYO launched in given the growth potential of the e-commerce industry. Ofri Kadosh, co-founder and CEO of PAYO, said that the full-suite of the new platform’s capabilities will help to minimize cancellations and increase revenues while allowing merchants to better navigate the process. “We know the struggle of businesses operating in the e-commerce space and what they have to contend with particularly when it comes to integrating cash-on-delivery in their payment process. One of the main challenges are order cancellations, which happens to about 30 to 35 percent of their transactions. For merchants, this means an automatic loss in revenue,” added Kadosh. In the Philippines, e-commerce is a fast-growing industry, especially since Filipinos spend 8.5 hours online a day. Around 33.3 million of the population use smartphones while 69M are active internet users. In 2016, the annual e-commerce revenue has a total of $1.5-Billion. Furthermore, Filipinos lead the world globally in terms of amount of time spent on social media, spending an average of four hours and 17 minutes a day on social platforms, according to a 2017 report by social media management platform Hootsuite and social media consultants We Are Social Ltd.
Kadosh noted that local merchants need to integrate COD in their business model given that 93 percent of the Filipinos prefer paying cash when buying online. Only eight percent of the population carry a credit card while 72 percent still do not have bank accounts. To help e-commerce businesses, PAYO developed a platform that will allow for both the merchants and their consumers to experience better and faster COD transactions. It works as an interface that can be added to the merchant’s shopping carts. Once the consumers start placing their orders, a pool of data scientists will then process every sale, as well as to record and analyze the clients order history. PAYO developed a consumer data analysis that builds credit history for COD consumers and employs fraud detection to identify potentially problematic accounts minimizing the incidence of cancellations even before the parcel leaves the merchants’ warehouse. Working with any courier, PAYO Solution also integrates courier optimization algorithms to choose the most convenient and practical type of courier to use from among the company’s pool of trusted partners. Among these are LBC, 2GO, Black Arrow Express, Ninja Van, Honest Bee, Zoom, Lalamove and Dalasia. While the product is moving from the merchant’s warehouse to the customer, PAYO’s solutions can also be used to streamline the process of tracking the orders and communicating with the customers for updates of their order. Once the delivery is successful, PAYO can also monitor money collection and remit the earnings to the merchant. What’s more, the data insights collected from all the deliveries drawn from Payo can be utilized as well to ensure early and immediate remittance to help merchants manage cash flow and scale up their business. As part of its commitment, PAYO only charges when the delivery is successful assuring the merchants of good service. Aside from the launch of the new platform, PAYO is set to release a mobile application later this year to make it easier for consumers to track their orders. With this app, the consumer will be updated on the whereabouts of their orders allowing them to manage their own orders. PAYO recently partnered with Paynamics and Ipay88, two of some of the biggest gateways in the Philippines and Southeast Asia. These will be fully integrated to Payo’s platform during the first quarter of 2018. The company also recently concluded a business model and contract with TackThis!, an effective e-retail solution with social commerce capabilities that empowers individuals and businesses to sell across the web, social media and through mobile. First launched in December 2016, PAYO was developed for HLM, an ecommerce platform and a leading call center business founded by Kadosh and his business partner, Liron Gross, co-founder and COO, to scale up their sales and reduce cancellations. The Philippines was the first country PAYO launched in given the growth potential of the e-commerce industry. At present, PAYO continues to get a huge traction in the ecommerce industry as it now handles COD transactions for big brands, such as National Bookstore, Sunnies Specs and Sole Academy, among others. To know more about PAYO, visit its website at https://payo.asia/ or email them at info@payo.asia. MANILA, Philippines - The primary suspect to the killing and torture of overseas Filipino worker (OFW) Joanna Demafelis has been arrested, the Department of Foreign Affairs (DFA) confirmed the news on Friday, February 23. President Rodrigo Duterte visited the wake of slain Kuwait overseas Filipino worker (OFW) Joanna Demafelis in her hometown in Sara, Iloilo. DFA Secretary Alan Peter Cayetano revealed that Nader Essam Assaf, a Lebanese national, was arrested by the Lebanese authorities. Assaf, with his wife Mona, a Syrian national, are the principal suspects in the killing of Demafelis, 29, who had served as their house helper. “Kuwaiti authorities conveyed the arrest of Assaf to Ambassador Renato Villa during a meeting at the Ministry of Interior on Thursday,” he added. The death of OFW Joanna Demafelis became the symbol of OFWs’ plight and struggles against abuses. When her remain was found in a freezer in an abandoned apartment in Kuwait earlier this month, there was a public outcry to finally end the abuses in the Gulf state. An autopsy report even showed that she was severely beaten before being frozen for more than a year. The horrific murder had led President Duterte to call for a deployment ban in Kuwait. President Duterte is set to hold a meeting with Kuwait Ambassador to the Philippines Musaed Saleh Althwaikh. Aside from discussing the deployment ban, the Philippine government is urging the Kuwaiti government to sign the long-standing memorandum of agreement that will protect OFWs in Kuwait. MANILA, Philippines - An engineering teacher decided to teach his students a life lesson in manners by making them take an exam in Spanish. The Facebook post of Jayson Garces Bayogo, a teacher at Cebu Technological University (CTU) had gone viral after it earned mixed reactions from netizens. Bayogo explains that while he was busy lecturing in class, he noticed some of his students “murmuring.” The teacher soon realized that they were not paying any attention to his lesson but was studying for their Spanish exam. Feeling irritated, Bayogo decided to end the discussion and dismissed the class early. The post had garnered mixed reactions from netizens, some called it a bit harsh while others believed that the class deserved it. The engineering teacher edited his post to clarify his intent. He said that lesson in manners and respect was what he really wanted to teach. The post has been earned 7,600 reactions to date. It takes more than intelligence to be a teacher, more often it also required guts. Just like Sir Jayson, one teacher also became viral last month for her unique way of teaching life skills. Teacher Karen Grace Atienza became viral for proving that learning can be fun. Her funny and cool antics were captured on video and uploaded by her student Karl Cantela. The video was shared 4,700 times since posting. Another Filipino teacher is also making a name globally for being chosen as part of top 10 of the prestigious Global Teachers Prize 2018. Dr. Jesus Insilada was picked to represent to country to compete for the title of the best teacher in the world. His culture-based approach in teaching made a huge impact to his students and community. MANILA, Philippines - Sans Ben Simmons and other Australian NBA players, the Boomers still outscored Gilas Pilipinas, 84-68 in the FIBA Asian Qualifiers of the 2019 World Cup on Thursday, February 22, 2018 at the Margaret Court Arena in Melbourne Australia. Philippines’ land-down-under campaign didn’t start as planned. Although the nationals got the possession after the tip off, they were welcomed by massive defensive stops and were pinned down 5-0 by Australia. Gilas however, immediately bounced back and equalized the score in less than a minute. Team Pilipinas snatched the lead 12-11 at the 4-minute mark courtesy of naturalized player and NBA veteran Andray Blatche. Gilas intensified its defense in the latter part of the opening quarter that forced the Boomers to take their shots from the outside. With Philippines’ glue-tight defense, Coach Chot Reyes and his boys managed to even the digits, 19-all after the first 10 minutes of the game. Despite Jayson Castro and Jio Jalalon’s absence due to injuries, the team’s backup guards, Kevin Alas and Calvin Abueva contributed some valuable figures as they started the 2nd period to break the deadlock. Australia’s Head Coach, Andrej Lemanis, saw that his team was having hard time in matching their opponents’ speed in spite of their height advantage, promptly called a timeout to adjust their game plan and cut Philippines’ 5-point lead. Just as Gilas had its rhythm, point guard Kiefer Ravena fall awkwardly on the floor after successfully dishing a dime to June Mar Fajardo. Ravena, held onto his ankle and was brought back to the bench for further evaluation. The Boomers took back the lead, 31-30 with over 3 minutes left in the half. Gilas showed numerous lockdowns on the Australians but the Aussies got so lucky in 2nd chance points and the main reason of their comeback. Australia finished the 1st half strong with a 5-point, 37-32 lead entering to the 3rd quarter. The margin could’ve been slimmer if Gilas just made most of its free throws if not all of them. Philippines missed 6 out of its 7 foul shots in the 2nd quarter alone. The Australians surprised the Filipinos at the beginning of the third and posted its biggest lead of 8 points. On the other hand, Gilas Pilipinas’ RR Pogoy and Kiefer Ravena countered with a 5-0 run to lower the margin to just 3. 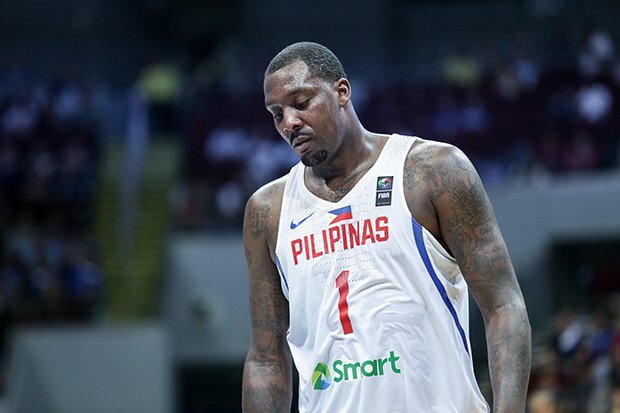 Just as Philippines had regained its momentum, Australia eventually got hot from the three point territory and imposed another huge advantage plus the misfiring Andray Blatche to add to Gilas’ concerns. Blatche looked exhausted and was unable to run the floor and get rebounds. Coach Reyes decided to pull him out and give him a breather. Australia’s own naturalized player, Kevin Lisch and Angus Brandt kept on pounding the the rim as they sensed that Andray Blatche can no longer jump and Philippines lacked support in the defensive end. Australia dominated the penultimate quarter with 63-49 advantage. Matthew Wright led Philippines in an attempt to turn the tides in its favor. June Mar Fajardo, who was in foul trouble aided Wright offensively and defensively to fill in Andray Blatche’s role in the middle. Coach Chot Reyes seemed to wave the white flag too early as he sent the newcomer Abu Tratter with 3 more minutes left in the game clock. Tratter fired a mid jumper as soon as he touched the ball and made it. Philippines fought so hard but fell short and handed the 84-68 victory to Australia to top their bracket with 3 wins and no loss while. Team Pilipinas on the other hand, landed in the 2nd spot with 2 wins and 1 loss. 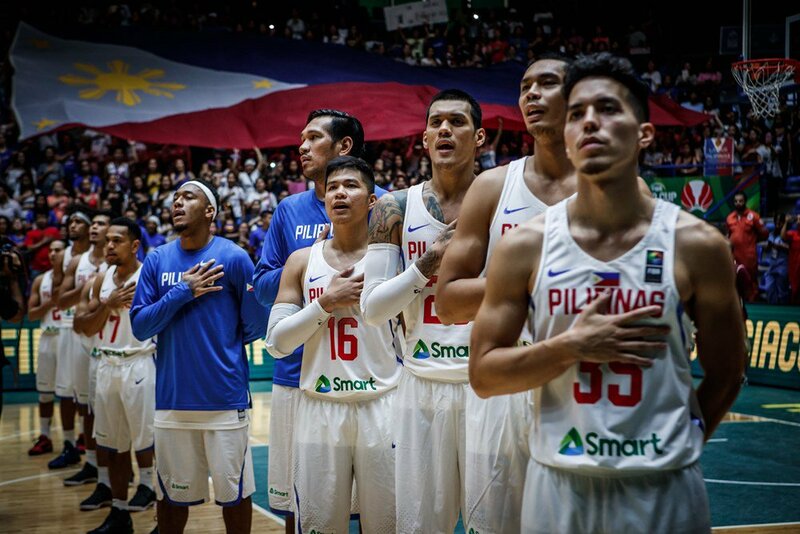 Gilas Pilipinas will fly back to Manila to face team Japan with a chance to redeem itself after the tough debacle on Sunday, February 25 at the MOA Arena at 7 pm. MANILA, Philippines - A snatcher was caught on video trying to open the bag of a sleeping passenger beside him. The attempt failed because concerned passengers woke the victim up. A Facebook post by Ghale Hornada has garnered the attention of netizens after he told the story of a snatching incident he witnessed. In a video, a man with a backpack was seen sitting beside a sleeping woman passenger. At first, nothing suspicious happens until you start to notice that the man had kept his hand underneath his bag. Then, he is actually trying to open the bag of a passenger beside him. Hornada also added that he had already noticed the man already attempted to open the bag of the woman on his right side but failed. So, the snatcher proceeded with the sleeping passenger instead. 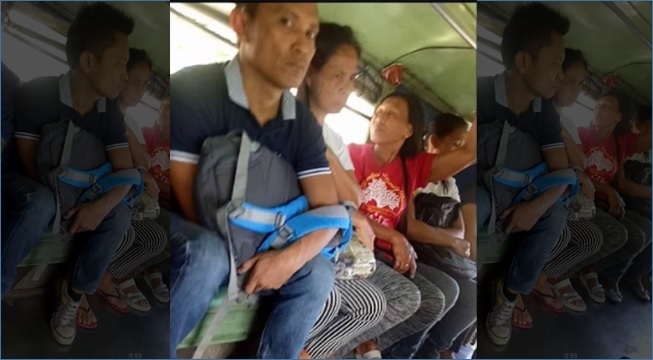 He revealed that he was so nervous but was glad that the other passengers also noticed and eventually stopped the snatcher. One passenger (the one on the snatcher’s right) alerted the sleeping victim by grabbing her bag away from the snatcher. Other passengers started to chime in that the man was attempting to open her bag. The snatcher immediately asked the driver to stop and he quickly got off. He also reminded other passengers to remain awake inside the jeep. The National Capital Regional Police Office has released their top 10 Modus Operandi of the most common crimes in Metro Manila and other areas. Included in the list is the “Salisi Gang,” “Dugo Dugo Gang,” “Budol Budol Gang” and many others. Last year, a group of woman snatchers was also caught on CCTV acting as shoppers. They were able to successfully open the bag of a woman shopper and steal her cellphone.